Exact Sciences Corp. recently announced that Mayo Clinic will be the first health system to offer Cologuard®, the first and only Food and Drug Administration (FDA) approved, noninvasive stool DNA screening test for colorectal cancer. Cologuard will be available to patients through their primary care physicians at Mayo Clinic. Available by prescription only, Cologuard offers people 50 years and older who are at average risk for colorectal cancer an easy to use screening test which they can do in the privacy of their own home. It is the first noninvasive screening test for colorectal cancer that analyzes both stool-based DNA and blood biomarkers to detect cancer and pre-cancer. The Cologuard technology platform was co-developed by Exact Sciences Corp. and Mayo Clinic as part of a broad, exclusive collaboration. “Cologuard represents a significant advancement in identifying colorectal cancer at its most treatable stage. We believe offering this new tool will promote patient and community public health and may move more patients to get screened earlier—a critical step in beating this prevalent and preventable cancer,” says Vijay Shah, M.D., chair of Mayo Clinic gastroenterology and hepatology. Colorectal cancer is highly preventable with screening. However, 23 million Americans between the ages of 50 to 75 are not getting screened as recommended, and as a result, it remains the second-leading cancer killer in the United States. For those whose cancer is detected at an earlier stage, the five-year survival rate can be greater than 90 percent. 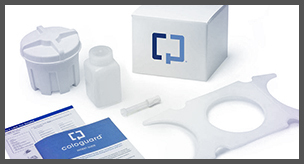 Cologuard is designed to detect DNA alternations and blood released from cancer and precancerous colon lesions. The test requires a physician order. After the physician orders Cologuard, the kit is mailed directly to the patient’s home. The patient then collects a stool sample in the Cologuard Collection Kit, and sends the kit back to the Exact Sciences lab for testing through a pre-paid mailer. For more information, visit Cologuardtest on their site. More information on colon cancer, and the importance of screening and early detection can be found here. Disclosure statement - David Ahlquist, M.D., is a co-inventor of the technology that has been licensed to Exact Sciences from Mayo Clinic. Under that licensing agreement, Mayo Clinic and Dr. Ahlquist share in equity and royalties. Revenue Mayo Clinic receives is used to support Mayo's not-for-profit mission in patient care, education and research.